Looking to enhance the safety and security of your home or business? Here at Buckley’s Securitysmiths, we’re the experts when it comes to designing, installing, and maintaining alarms for residential and commercial clients throughout Colonial Heights, PA. If you’ve been putting off having an alarm system installed in your home simply because you don’t want to worry about unsightly wires running throughout your house, ask us about our wireless alarms. Unlike traditional alarms where the motion sensors and control panel need to be connected with hard wires which are either run inside your walls or along your ceilings, today’s wireless home alarm systems use radio frequency technology to transmit signals between the individual sensors and the central control panel. This allows for a clean, non-destructive installation, making it easy to install motion detectors, smoke, and Co2 monitors, and alarms on your windows and doors – even if you rent your home. Whether you own a small professional office, manage a restaurant, or run a large commercial building, a quality commercial alarm can help keep your staff, clients, and inventory protected. Our team of certified commercial alarms specialists can supply you with the right alarm system for your specific application. 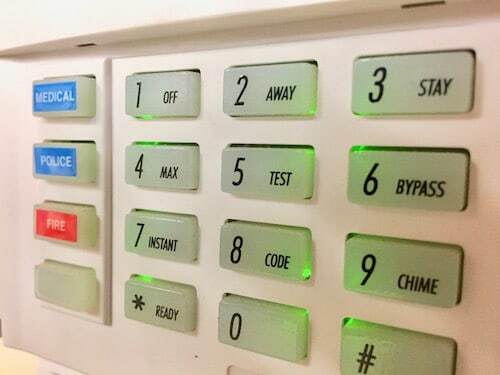 We supply and install stand-alone alarms to control access to storage rooms, multi-layered alarm systems for multiple entry points, and even silent alarm systems that are designed to alert authorities to threats that occur while your business is open such as a burglary or assault. We also perform regular maintenance and on-demand repairs to all makes of commercial security systems, and our mobile alarm experts are available 24 hours a day, 7 days a week to respond to emergency calls. If you want to upgrade your home security system to one that you can control through your smartphone, tablet, or laptop computer, we’re here to help. Our team of experienced locksmiths has the skills it takes to design and install a complete smart home security system for you that includes a professional alarm. We’ll ensure that your keyless entry locks work seamlessly with your wireless alarm interface, giving you the ability to monitor your home alarm from anywhere, at any time. We can integrate high-definition cameras, smoke and heat detectors, and window break sensors with your smart alarm system to create a custom home alarm system that’s designed with your specific needs in mind. To learn more about how our team of fully licensed, registered, and insured locksmiths can help enhance the security of your home or business, contact us at Buckley’s Securitysmiths today. We install and service alarms throughout Colonial Heights, VA, as well as the surrounding areas including Petersburg and Chester, VA.
We’ve been creating peace-of-mind since 1985, and we guarantee all of our commercial alarms, wireless alarms, and home alarm systems.